Well, it's official: Prince George is now a big brother after Kate Middleton and Prince William welcomed Royal Baby #2 on Saturday, May 2 at 8:34 am UK time in the Lindo Wing of St. Mary's hospital. It's a happy occasion that people around the world are celebrating, but George probably has more reason to celebrate than anyone else. He's got a baby sister! And while older siblings can sometimes be a bit apprehensive when new babies join the family, I have no doubt Prince George will be an awesome big brother. He finally got to meet her a few hours after she was born, arriving at the hospital with his dad and looking rather bewildered about it all, as any toddler would be. While Prince George waved alongside Prince William at the cheering crowd, you have to sort of wonder what the kid's really thinking of... well, everything that's going on. He's one of the most famous children in the entire world, and though he doesn't understand the gravity of the situation just yet, he will one day rule the United Kingdom. Plus, Mummy went away a few hours ago and now there's a whole new baby that's going to come and live with him and get much of the attention he's been receiving for the past couple of years? That's gotta be rough. While we may not know what exactly is going through Prince George's brain (and given that he's not even 3 years old, probably not much), we can at least take a playful guess at what he might be thinking, right? Right. Onwards! "Why do these people want to take my picture all the time?" A crowd of reporters have been camped outside the Lindo Wing for over 24 hours, waiting for the arrival of the new princess. It's a big deal, but George can't possibly get why all those cameras are clicking away when he's just getting out of the car with his dad. "Uh, I'm still third in line to the throne!" Sure, there's always fuss over a new baby, but George is third in line for the throne, right behind Prince Charles and Prince William. George's little sister is fourth in line, and we all know third is better than fourth. "I am NOT sharing my toys!" Seriously — they're his! Besides, girls don't wanna play with action figures, anyway, and even if she does, too bad. He ain't sharin'! "I'm older, so I'm the boss!" 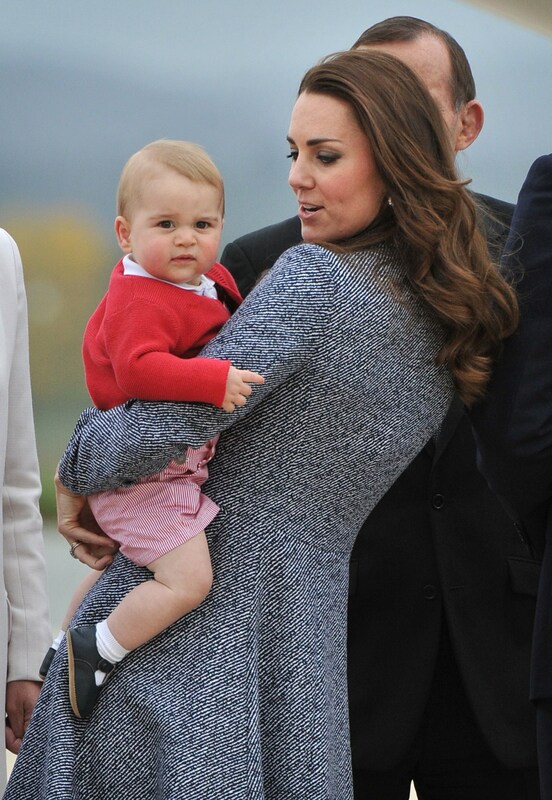 Sure, George is only 22 months old, but so what? That's 22 months older than the new baby! She'd better listen to him, 'cos he's the big brother and he makes the rules! "That baby had better not keep me up at night with all that crying!" Babies cry — George should know, he was one (and kinda still is). But the future king needs his beauty sleep, so his new sister needs to keep the crying to a minimum. "I'm still Mummy's special boy!" Having a newborn in the house (palace, whatever) likely means that much of his parents' attention will go to caring for her, but they won't forget George. He's still his Mum and Dad's first born and no princess can take that away from him. Seriously, it's the little prince's nap time now. Where's his blankey?